Loud snoring, chronic fatigue, inability to concentrate and focus throughout the day, and depression are all signs that you may be suffering from a sleep disorder known as sleep apnea. This serious condition causes you to stop breathing during sleep, typically due to a blocked airway. Your brain reacts to the lack of oxygen by causing you to wake up, and this can happen many times during the night, even hundreds of times in severe cases. How Do You Diagnose Sleep Apnea? Sleep apnea is typically diagnosed with a sleep study prescribed by your general practitioner. Dr. Dilolli works closely with your physician to obtain all the information from your diagnosis, which will help her determine which type of oral appliance is right for your needs. Sometimes oral appliance therapy may be combined with continuous positive airway pressure therapy (CPAP) to achieve the best outcome for patients with severe sleep apnea. If I Snore, Do I Have Sleep Apnea? While snoring can be an indicator of sleep apnea, not everyone who snores has the disorder. In fact, it’s estimated that half of adults snore from time to time. The snoring that indicates sleep apnea tends to be very loud and may keep your partner awake at night. Waking with a gasp for air or a cough can also be a sign of sleep apnea. 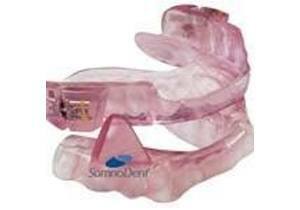 Patients with mild to moderate sleep apnea often see great results with oral appliance therapy. Dr. Dilolli customizes oral appliances based on each patient’s unique needs and the level of severity of their sleep apnea. The oral appliance is often able to slightly reposition your jaw so your soft tissues don’t block your airway and then you’re able to breathe freely throughout the night. When you don’t get the rest you need each night, it greatly affects your overall health and well-being. Patients who treat sleep apnea with oral appliance therapy begin to see increased energy, less headaches, increased ability to concentrate, and relief from depression. If you’re not getting the rest you need and deserve each night, or if you’re keeping your partner awake at night with loud snoring, it may be time to learn how Dr. Dilolli can help you. Contact Virginia Dentistry By Design for more information.